This article is about the city. For the district, see Rajshahi District. For the division, see Rajshahi Division. Rajshahi (Bengali: রাজশাহী, [radʒ.ʃaɦi]; historically Rampur Boalia; nicknamed Silk City) is a metropolitan city, and a major urban, commercial and educational centre of Bangladesh. It is also the administrative seat of eponymous division and district. [note 1] Located on the north bank of the Padma River, near the Bangladesh-India border, the city has a population of over 763,952 residents. The city is surrounded by the satellite towns of Nowhata and Katakhali, which together build an urban agglomeration of about 1 million population. Rajshahi Railway Station in the 1930s. Rajshahi district was a part of the Pundra region of ancient Bengal. The capital of Vijay Sen, the king who led military operations in Sri Lanka and Southeast Asia was located 9 miles (14 km) to the west of Rajshahi town. In medieval times, the region came to be known as "Rampur Boalia". The origin of the present name of "Rajshahi" is debated among scholars. Most say that it takes its name from Hindu Kings and zamindars (or "Rajas") as Raj and the persianised Shahi; both of which mean "royal" or "kingdom". The administrative district was established in 1772 and the municipal corporation in 1876. Rajshahi was dominated by various Maharajas, Rajas and Zamindars. It was made a city corporation in 1991. During the British Raj, it was also known as "Beuleah" and was the administrative headquarters of Rajshahi district in Eastern Bengal and Assam. It was originally chosen as a commercial factory for the silk trade, which was being officially encouraged by the agricultural department of that time. The town contained a government college, and an industrial school for sericulture. Most of the public buildings were severely damaged by the earthquake of 12 June 1897. Throughout much of the early part of the twentieth century there was a daily steamer service on the Ganges which connected it to rail-heads that led to the then provincial capital of Calcutta as well as other cities in the province of Bengal. Along with all of Bangladesh, Rajshahi witnessed both great atrocities by the Pakistan army and heroic struggles by the freedom fighters during the liberation war in 1971. The largest mass grave in Bangladesh is located in Rajshahi University, which was used as an army camp during the war. On the other hand, one of the great battles of the war took place near Rajshahi. Captain Mohiuddin Jahangir, who died in battle, was awarded the highest honour (Bir Shrestho) by the Bangladesh government after the war. Geographically Rajshahi is situated within Barind Tract, 23 m (75 ft) above sea level, and lies at 24°22′26″N 88°36′04″E﻿ / ﻿24.37389°N 88.60111°E﻿ / 24.37389; 88.60111.The city is located on the alluvial plains of the Padma River, which runs through southern side of the city. It is bounded on the east, north and west by Paba Upazila (subdivision of a district) of the district. Although once noted for its air pollution, since 2014 the levels of particulates have been dramatically reduced by various efforts to switch to cleaner fuels and to battery-powered vehicles, to pave earth streets, to encourage walking and bicycle transport, and to plant vegetation. The levels of PM10 dropped by 67% and PM2.5 which are particularly harmful to human health, dropped from 70 to 37 micrograms per cubic metre between 2014 and 2016. Shahid Qumruzzaman central park and zoo is one of the popular public places of Rajshahi city. A wide area with lush green trees and grasses houses different animal species. It is located by the bank of the Padma River. Other parks in the city are Bhubon Mohon park and Captain Monsur Ali park. Shahid Zia children's park is specially designed for children's amusement. The bank of the Padma river along the city is very popular destination for recreation. The bank is a planned zone in many parts of the city to accommodate city dwellers for recreation purposes. Munsguard park near the old Dutch Borokuthi building and Lalonshah park near Shahmukhdum Eidgah have been recently built to give residents a place to enjoy the views of the Padma river. Banks of the Padma River: A lovely sight of one of the largest rivers in South Asia. During the Monsoon season, the water level rises, along with its beauty. Varendra Research Museum: Established in 1910, the museum is dedicated to ancient history and culture. It is recognised as the oldest museum in the country. It has a rich collection of artefacts, relating to Hindu, Buddhist and Muslim heritage. Some of these date back to the 16th century. It is maintained by the University, located in the heart of town. Shrine of Shah Makhdum Rupos: A dargah (tomb) was established to mark the resting place of Shah Makhdum in 1635. He was the first preacher of Islam in the region. Legend has it that he arrived by riding down the Padma on two crocodiles. To preserve this myth, some crocodiles are kept in the pond next to the shrine. Kamruzzaman Central Park and Zoo: The park is a wide area with lush green trees and grass. The zoo houses a variety of animal species. It is located by the bank of river Padma. Shahid Zia Park: An amusement park for pleasure. It has a mono rail and bumping cars. It is under the Rajshahi City Corporation. University of Rajshahi: This well-planned beautiful green campus is within a few kilometres from the city centre and easily accessible. Shaheb Bazar: This is the centre of the city, where most of the shopping malls and commercial buildings are located. Ghoramara: The oldest part of Rajshahi City, consisting most of the oldest (70 to 100 years old) buildings. Borokuthi: In the compound of the Barakuthi there is a small cemetery with groves dating back to the nineteenth century. There are 14 tombs with thirteen epitaphs within the cemetery. Upashohor: This is a planned model town. Rajshahi Cantonment is located beside this area. Motihar: Rajshahi University is situated in this area on a large campus surrounded by mango groves that presents a panoramic view. Kashia-Danga: From this area a massive mango tree garden area of Rajshahi starts. It is in the west part of the city, near to Rajshahi court railway station. Santal Para: Located inside the Mahish-Bathan Area. Some Santal tribes people live here. Anyone can have a look to their tribal life. The Padma River passes by the southern side of the city. 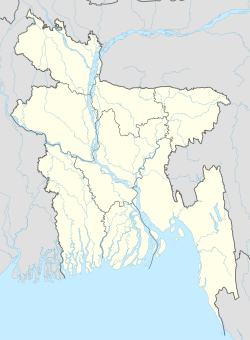 Rajshahi is the headquarter of one of the eight administrative divisions of Bangladesh. Divisional Commissioner, who is the administrative chief of Rajshahi Division, DIG for Rajshahi division and other divisional civil servants have their own offices in the city, which functions as part of the government administrative setup. Deputy Commissioner (DC) who is the administrative chief of Rajshahi District, Civil Surgeon and other district level civil servants have their offices in the city. District judges as well as Metropolitan magistrates have their offices within the city. Rajshahi is one of seven metropolitan cities in Bangladesh. One mayor and 30 ward commissioners are elected for five-year terms by direct votes. Rajshahi City Corporation is responsible for all the administrative work related to city governance under its jurisdiction. Rajshahi Metropolitan Police (RMP), headed by a Commissioner, controls law and order as well as traffic movements within the metropolitan area. Rajshahi Unnayan Kortripokhkho/Rajshahi Development Authority (RDA) plans and coordinates the development related works within metropolitan area. Rajshahi WASA is responsible for water supply and drainage system within city area. Apart from the usual agricultural products of Bangladesh, such as rice, wheat, potatoes and lentils, Rajshahi and its neighbouring regions are specially suited from various crops such as mangoes, lichis, sugarcane, tomatoes and watermelons. In spite of being an important city and located on a riverbank, industrial development in Rajshahi has not taken place to any great extent. There is an industrial park in Rajshahi, which is now mainly home to industries producing products of the famous Rajshahi silk. The head office of regulatory board for sericulture, Bangladesh Sericulture Development Board, is based in the city. Rajshahi is also home to a number of jute, textile and sugar mills, pharmaceutical and mango based industries. Two 50 MW power plants have been built at Katakhali to meet the growing electricity demand of the city. Rajshahi is known for its educational, literary and artistic heritage. Rajshahi is famous for Rajshahi silk, which has a special status as clothing material in Indian subcontinent. Rajshahi is the home of the region's best mangoes and lichis. Rajshahi is also the location of Barendra Museum, which is known for its collection of local sculpture and other artifacts dating from medieval times. It also has some important structures made by the British like the T Dam. As an important city of Bangladesh, Rajshahi has a vibrant cultural life. Annual celebrations for Independence Day (26 March), Language Martyrs' Day (21 February) and Victory Day (16 December) are prominently celebrated across the city. Pohela Baishakh, the Bengali New Year, falls annually on 14 April and is popularly celebrated across the city. There are widespread celebration of Muslim festivals of Eid ul-Fitr, Eid ul-Adha, and Muharram; Hindu festivals of Durga Puja, Buddhist festival of Buddha Purnima; and the Christian festival of Christmas across the city. There are many Bengali daily newspapers published from the city, including Sonali Sangbad, Sunshine, Dainik Barta, Sonar Desh, Natun Provat, and Amader Rajshahi. There are also online news portal such as rajshahinews24.com, silkcitynews.com, upnews24.com etc. The government-run Bangladesh Television and Bangladesh Betar have transmission centres in Rajshahi. A local FM radio station, Radio Padma, transmits at 99.2 MHz frequency. Radio Foorti transmits at 88.0 MHz. There are three 15,000+ capacity stadium in the city. One at the centre of the city which is normally called the Rajshahi District Stadium, another is inside the Rajshahi University and the last one basically used for cricket is located at Terokhadia called Shaheed Qamaruzzaman Stadium. There is also an international standard tennis complex and few sports training academy in the city. Many national level footballers groomed in the city such as arguably the best goalkeeper in Bangladesh history. The city is the home of several national level club teams like Digonto proshari and Sonali Otit. There are also a few football training academies including one in the Rajshahi's central eidgah (large open ground used on special occasions for Muslim prayers) and in the Zilla stadium. The city is an important place for cricket in Bangladesh. As regular supplier of cricketer in the national team, it is also the home of Bangladesh Premier League team Rajshahi Kings. The city has two cricket academies Banglatrack and Clemon, to grow and train upcoming cricketers. Rajshahi is also known for hockey. There are many local hockey practice clubs that give opportunity to play in national, inter-university, college, and school levels. There are National Team hockey players from Rajshahi. Late Mintu was one of them and by his name there is "Mintu Chottor" at lokkhipur mor, Rajshahi. Rajshahi is connected to most other parts of the country via the N6 national highway. There are two intercity bus terminal in the city. It takes about 5 to 6 hours by road to reach the capital city Dhaka. A number of bus services, including air-conditioned and non-air conditioned buses, are available to and from Dhaka. Bus services to other major cities and districts headquarter are also available from Rajshahi. Cycle rickshaws and auto rickshaws are the main mode of transport within the city and metro area. Once there were plenty of Tomtom (horse driven cart) in the city, which are still found, but are rare. There are bus and minibus services in a limited number of routes to the suburban areas of the city. Plenty of rental car agencies operate within the city and metro area, where sedans, SUVs, and micro-buses are available to hire on an hourly or daily basis. The city has many government, private and NGO run hospitals. Rajshahi Medical College Hospital (RMCH) is a tertiary level public hospital with a teaching facility in graduate and postgraduate medical education. There are also a children's hospital, one chest hospital, a district level government hospital and a Christian missionary hospital within the city area. There are two private medical college hospitals, and another two are under construction in the city. Population of the city proper is about 0.77 million. The metro area (which includes satellite towns of Nowhata and Katakhali) has an estimated population of about 1 million. Bengali is the main language for the citizens of the city. Many distinctive Bengali dialects and regional languages are also spoken. English is understood widely, especially for academic and business purposes. There is a minority Urdu-speaking population, who are descendants of displaced Muslims from the eastern part of British India who sought refuge during separation of India and Pakistan in 1947. The literacy rate of the city is 74.1%. Islam makes up about 86% of total population; about 13% people follow Hinduism, and 1% follow other religions like Buddhism, Jain, Sikh and Christianity. Rajshahi is home to many government and private educational institutions. The city is home to the Rajshahi College- which is the third oldest college in Bangladesh after Dhaka College, and Chittagong College, Rajshahi Medical College, the second oldest medical college in erstwhile East Pakistan. The University of Rajshahi is the second oldest and one of the largest public universities in the country. Rajshahi Engineering College, now known as RUET, was the second engineering college established in the then East Pakistan in 1964. The first was Ahsanullah Engineering College, now BUET. ^ "Area, Population and Literacy Rate by Paurashava −2001" (PDF). Bangladesh Bureau of Statistics. Archived from the original (PDF) on 17 December 2008. Retrieved 19 August 2009. ^ "PM opens 8 new police stations in Rajshahi". Rising Sun. 22 February 2018. Retrieved 15 September 2018. ^ a b "Rajshahi (Bangladesh): City Districts and Subdistricts - Population Statistics in Maps and Charts". ^ "800 years of Rajshahi city". The Independent. Archived from the original on 6 June 2013. Retrieved 8 July 2011. ^ Singh, Nagendra Kr (1 January 2003). "Encyclopaedia Of Bangladesh (Set Of 30 Vols.)". Anmol Publications Pvt. Limited – via Google Books. Chisholm, Hugh, ed. (1911). "Rajshahi" . Encyclopædia Britannica (11th ed.). Cambridge University Press. ^ a b Graham-Harrison, Emma; Doshi, Vidhi (17 June 2016). "Rajshahi: the city that took on air pollution – and won". The Guardian. Retrieved 9 July 2016. ^ "Rajshahi University of Engineering & Technology - RUET". www.ruet.ac.bd. Retrieved 2 December 2016. ^ Government of Bangladesh refers to administrative seat of its divisions and districts as headquarters and not as capital.